Ah, how nice is it to not use titanium cups and bowls, let me tell you. This is the story of Kupilka dishes and cutlery, so to start of I recommend you get yourself a fine cup of coffee and put your mind on eating and drinking in style! First off, Kupilka is a Finnish company, which already gives them Rockstar status. There's simply nothing bad coming out of this country, we got a rocking education and social welfare system, we won the Eurovision Song Contest with a metal band (Hard Rock Hallelujah) and the Moomins are at home here. Point made, superiority of Finland acknowledged. The Kupilka 5 shot glass I use daily for my Sea-Buckthorn berries shot to stay healthy, it has the right size and is nice to look at - as we say in Germany, "Das Auge isst mit". I yet have to consume alcoholic beverages out of it, but with the holiday season looming large I reckon it is just a question of time till it is baptized with the likes of Minttu and Vodka and it sure will make a good figure with it. Having a long reindeer leather cord is handy in case you consume too much alcohol, just hang it around your neck and you can't lose it! An ice cold shot with the Kupilka 5. Having your own bowl and cutlery comes in so handy when living with seven other people in a flat, I can't stress that enough. The Kupilka 55 bowl is my multiuse item of choice for the likes of breakfast müsli, lunch soup and bread as well as dinner pasta, couscous & stews, and anything in between. It has the right size (which is 5,5 dl) for my size of meals, and if you have group meals as we do here in the course, having a bowl like this is highly recommended. On our snowmobile/ skiing trip this bowl will likely serve as my eating bowl of choice, as we cook community meals. I love the handle, how often do you need to hold a steaming hot dish to grab something else, and how often did you burn your fingers? Outdoor dishes should come with a handle for holding it, mandatory. It also is my dish of choice when hiking with my partner, she gets the pretty bowl & cutlery, I eat from the pot. I thus find it mandatory for hiking with my partner, because a happy partner means more trips together! I won't lose much words on the cutlery, except that it does what it is intended to do very well. For my use at the lad pad it is excellent, I love to have my own cutlery, and it is, as the rest of the dishes, easy to clean and pleasing to the eyes. A tasty stew served in the Kupilka 55 bowl. 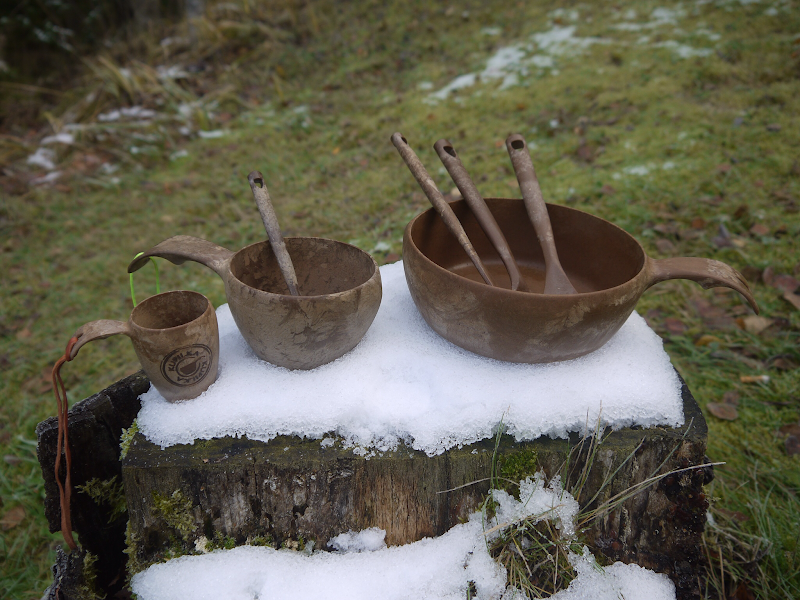 The Kupilka 21 has replaced my wooden kuksa on recent trips. I added a bright yellow piece of cord, as it has a rather camouflage colour and might be forgotten otherwise. Well, why would I replace my wooden kuksa, you ask? Weight, design and wetness are my answers. The Kupilka is lighter and has a superior handle, and it is completely immune to wetness. My wooden kuksa gets little cracks in the bottom when in a moist/ wet environment, nothing major just yet, but a concern nevertheless. It also is a bit bigger which is positive, I like a big cup of coffee in the morning and a big hot chocolate at night. Kupilka 21 kuksa = a good cup of coffee! On the material, because I can see that question form in your mind with my UL Jedi Master force. It is a composite material made of 50% pine wood and 50% plastic. What I like about this is that it is recyclable at the end of its life, as it can be grinded down and made into something new. That's completely awesome. What is less awesome is that, in comparison to 100% wood, the composite does not isolate as well. 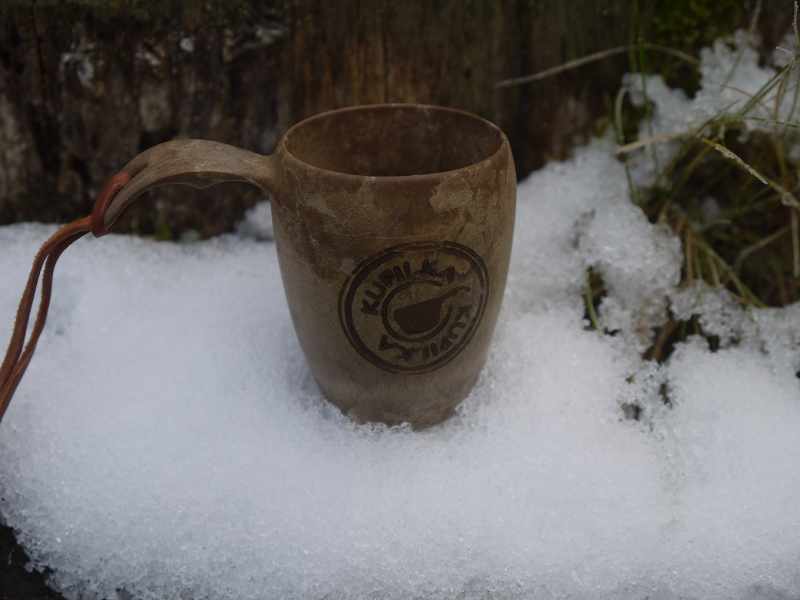 I'm not speaking about losing heat quickly, I haven't done a scientific study on it, but what I mean is that I can hold my wooden kuksa with a boiling hot coffee in my palm, with the Kupilka kuksa that leads to a test in enduring pain. But thanks to the handles on the kuksa and bowl that is less of a concern, though something to point out. Other advantages of the Kupilka material is that doesn't absorb smells and is insensitive to wetness, has a higher durability than wood & plastic on their own and finally, they're are very easy to clean - one could say the material is almost non-stick. You can even put them in a dishwasher, if you carry one with you. As I know that you're now hugely excited and asking yourself "Where can I get them?" you could just click that link, I'm that good, you see. Alternatively you can practice yourself in patience and wait till next week when there will be a raffle for three Kupilka 21 kuksas. Young UL Jedi, patience practice you shall. Edit: For orders, dealer inquiries, and blog/media inquries please contact Michael at Kupilka directly!